The very first issue of our new digital CMO Magazine has launched! This is a construction magazine with a difference – watch ‘How to’ guides, flick through image galleries, click on areas of interest and more. 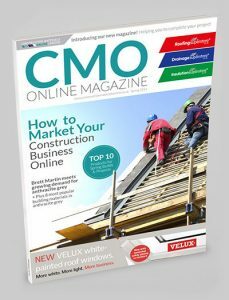 CMO Magazine is produced by the team who are behind all three of our superstores – Roofing Superstore, Drainage Superstore and Insulation Superstore, bringing a broad range of expertise together in one place. The first issue contains an interactive round-up of news, innovations and inspiration. Don’t miss…’CPD courses’ – including SuperFOIL’s ‘CPD Certified’ Installer Course, our top product picks for Spring builds and projects, ‘How to market your Construction Business Online’ from our in-house digital marketing experts, industry news, prizes and more!